As the coach raced west into the oncoming storm, buffeted by black clouds, I had to wonder what windy Liverpool had in store. But I needn’t have worried. On the edge of the city the sun suddenly appeared, and I received a right royal welcome. Liverpool One bus station is perfectly placed if, like me, you’re on a whistle stop visit. Simply cross over the Strand and you’re face to face with the grandeur of the Waterfront. The wind might have tugged at my coat tails, but I had a permanent smile on my face. And everyone smiled back! 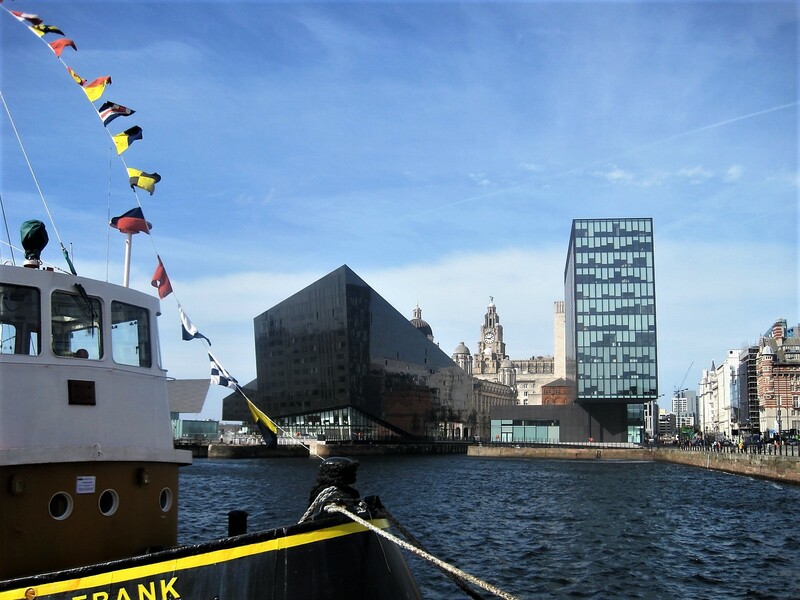 There is no doubt that Liverpool is a maritime city. The River Mersey rolls choppily away into the Irish Sea, part of a long history of seafaring. The Industrial Revolution established Liverpool as a major port, trading in coal and cotton, and also in slaves. In the 19th century it was a chief point of embarkation for North America, flooded with the mass of Irish immigrants resulting from the Potato Famine. The trio of the Royal Liver Building, Cunard and the Port of Liverpool buildings, collectively known as the ‘Three Graces’, dominate the Waterfront, an enduring symbol of the city. Since its decline, the dockland has been handsomely converted to tourism. Albert Dock is now home to Tate Gallery, the Merseyside Maritime Museum, International Slavery Museum and The Beatles Story, with shops and restaurants galore. The fierce looking cat, chasing those rats, is made from around 1000 recycled milk containers, collected by employees of the Cunard Building and sculpted by local artist Faith Bebbington. The Leeds-Liverpool canal terminates at the small marina in Canning Dock. Like most people, I seem to see pink everywhere I go these days. I hope you’re In the Pink this morning, Becky? Waffles for breakfast? Does anyone remember Billy Fury? He played my home town once and I was an excited member of the audience. Now his statue stands by a small green in front of the Pump House, his back to the river and the elements. Keeping him company, a hopeful family of emigrants. The Museum of Liverpool thrusts its nose towards the river, the words Imagine and Peace pleading to be heard. I know I will have to return later, but for now I have a different destination. The main purpose of my visit is to see the Terracotta Warriors exhibition at the World Museum. The wind continues to whip round corners as I try to orient myself. High on the skyline I have spotted the Radio City Tower. Officially St. John’s Beacon, created as a ventilation shaft for the shopping complex below, in 1970 it was home to a revolving restaurant. Radio broadcasting transferred to the 140 metre high tower in July 2000. What an exciting place to work! I should just have time to whizz up the tower in the high speed lift for that panoramic view. With rain forecast the following day, it’s now or never. From the tower I observe the Waterfront in miniature, and the two cathedrals- part of tomorrow’s itinerary. Almost directly beneath me, the World Museum. I have only to cross the small green park and I’m there. But first I have to check into my accommodation, chosen for its proximity to the exhibition. From the photo on the website I imagine I’m sleeping in a cupboard in Sleep Eat Love, but my ridiculously cheap single room, with ensuite, is amazing value for a city centre stopover. I sleep well after my exertions. I don’t intend to share all of my Terracotta Warrior images with you today. I really feel they deserve a post of their own. This is just a glimpse of what captivated me, and if you’re quick you may still have time to see them for yourself. China’s First Emperor and his warriors are on display till 28th October. I’d like to leave you with an exhibition that moved me deeply. Liverpool will always have a place in my heart as the birthplace of the Beatles. No-one was more horrified than me that day in October 1980 when John Lennon was shot dead. In the time since then his widow has done an amazing job at promoting world peace and keeping his memory alive. Yoko and the Museum of Liverpool present Double Fantasy. As you can probably imagine, life is a little hectic right now, but I do hope to share my Warriors with you, and a glimpse of my second day in Liverpool, before I head for the Algarve next weekend. I hope that you’ve enjoyed this one half as much as I did. And now to share some walks. Humble apologies to Shelley. I neglected to include this beautiful post last week. Please pay her a visit! That’s it for Jo’s Monday walk for a little while, though I will keep in touch. Please look after yourselves till then. I’m off out into the sunshine for a last walk with my Hartlepool group.